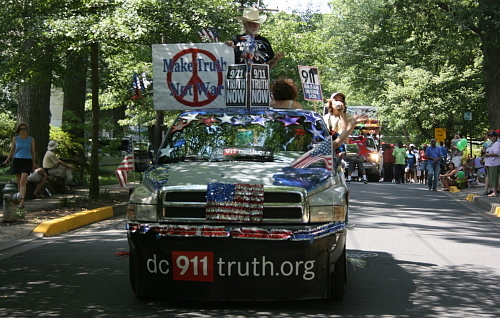 This was our fourth year participating in the Takoma Park Fourth of July Parade. We had a great time spreading the truth to a very receptive crowd. We handed out thousands of flyers and the special edition of the Rock Creek Free Press newspaper. The picnic after the parade at Sue's was fun and festive. 10:00 a.m. to 2:45 p.m. The presentation will reveal groundbreaking, independent, verifiable evidence with serious geopolitical and historical implications. It will feature a detailed deconstruction of the Flight Data Recorder information — allegedly from the black box of Flight 77 — released by the National Transportation Safety Board in 2006. A simulation of the official flight path based on this data, with carefully constructed topography and obstacles, will be compared to physical aircraft limitations by a certified pilot. The data and the physical damage will also be compared with first-hand videorecorded, witness accounts from Pentagon police, Arlington Cemetery employees, and Arlington citizens. This timely presentation, with rare photos and videos, challenges and undermines the official account of what happened on that tragic September 11, 2001. Richard Gage will be in Washington for an AIA conference July 14 to 16 (Tue-Thur). 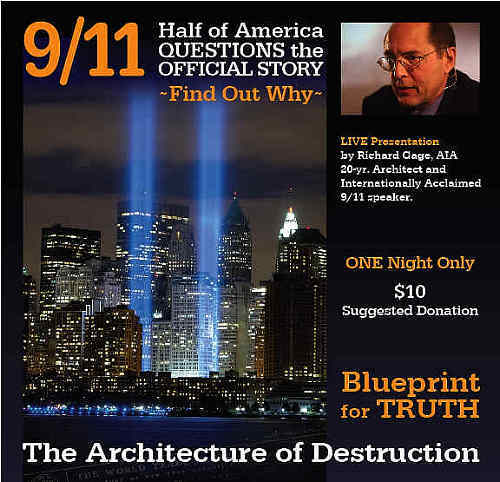 Richard Gage of AE911truth.org will be presenting his findings about the WTC building collapses to other architects and engineers at the regional AIA conference here in Washington, DC Tuesday thru Thursday July 14-16. On Thursday, July 16, Mr Gage will be making presentations at the Washington Convention Center, room 141. 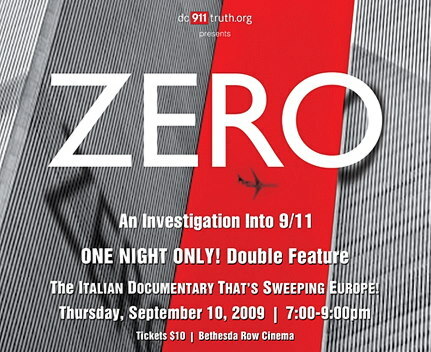 The architects will be showing the 30 minute film "9/11: Blueprint for Truth" on the hour throughout the day (10am - 4pm) with live Q&A following each showing. On the evening of Thursday July 16 Richard Gage will be making a presentation at the Busboys and Poets restaurant (14th and V St. NW). Two shows at 6:00pm and 8:00 pm. A donation of $10 at the door is suggested. Join us for a counter-inaugural bash. Sander Hicks of Vox Pop fame is touring the country promoting peace, truth and accountability. His tour culminates with a bash here in the DC area on the night of the Obama Inauguration, January 20, at the Lyon Park Community Center in Arlington. This Counter-Inaugural Party will feature music, refreshments and spirited political speeches. Sander Hicks: founder of Vox Pop and author of The Big Wedding, 9/11, the Whistle-Blowers, and the Cover-Up. DC 911Truth has produced an attractive new brochure to be distributed at the Obama Inauguration and surrounding events. On the cover, President Obama is asked to "help America learn the truth about 9/11," but the interior is aimed at general audiences who may not be aware of problems with the official account, or who may be quick to dismiss any questions as conspiracy theories. 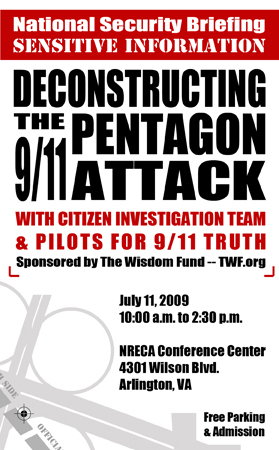 In a concise and straightforward way, the brochure presents the many facts that challenge the 9/11 Commission Report (including doubts expressed by Co-Chairs Thomas Kean and Lee Hamilton themselves), as well as contradictions in the accepted narrative about air defense, the alleged hijackers, the destruction of the World Trade Center, and the anthrax attacks. Only statements that could be verified in mainstream news sources were included and carefully footnoted, so as to maximize the credibility of the piece. At the end, readers are asked to face a difficult reality: 9/11 could not have occurred without high-level complicity from inside the U.S. government. They are urged to learn the truth and tell others‹especially the media and Congress‹with the goal of opening a new, truly independent investigation.